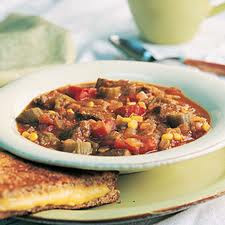 I think I made my Nanny's Stew and cornbread more this year than ever before. It is the easiest stew recipe ever! You can of course substitute cans for the real thing (which I do occasionally) but this is so easy and tastes so amazing! saute the onion and meat together in a big stew pot. Once the meat is brown and the onions are translucent, add everything else. Include the juices in the cans (don't waste that flavor!) Sometimes I add about 2 cans of chicken broth to make it stretch a little more but the consistency turns a little more like soup instead of stew. Bring it up to a boil and then let simmer for at least an hour or 2. The longer it simmers the better - I usually let it simmer for at least 3 hours. It tastes even better the next day. *You can cook the onions and meat the night before and put in the crock pot with the veggies in the morning on low, and your whole house will smell amazing when you get home!